The Ruger was topped off with a Sightron SII Big Sky 3-9 x 42mm scope with Warne Maxima QR steel rings: a scope that has helped produce 1/4 MOA groups both before and after its use on the two Ruger American Predator test rifles. No such luck with the sad-performing Ruger Predators. First, let's get the recital of the Ruger published specifications and features out of the way. Ruger Marksman Adjustable™ Trigger offers a crisp release with a pull weight that is adjustable between 3 and 5 pounds, allowing shooters to make that perfect shot. Ergonomic, lightweight moss green composite stock (designed for quick, easy handling) blends a classic look with modern forend contouring and grip serrations. Swivel studs are installed. The one-piece, three-Lug 70 degree bolt provides ample scope clearance. The bolt also utilizes a full diameter bolt body and dual cocking cams for smooth, easy cycling from the shoulder. Power Bedding® is an integral bedding block system that positively locates the receiver and free-floats the barrel for outstanding accuracy. Features an easy-to-actuate tang safety that provides instant security, visibility and accessibility. Rotary magazine fits flush with the stock and offers the smooth feed that has become the hallmark of Ruger® rotary magazines. Also features a factory installed one-piece aluminum scope rail. To cut to the chase, the test rifle did about everything you'd want in a rifle at this price point, except shoot good groups. For the rifle itself, in terms of basic function, the tang safety was excessively hard to disengage, but the bolt is smooth, the rotary magazine is excellent as is cartridge feeding, and the current user adjustable trigger is excellent. 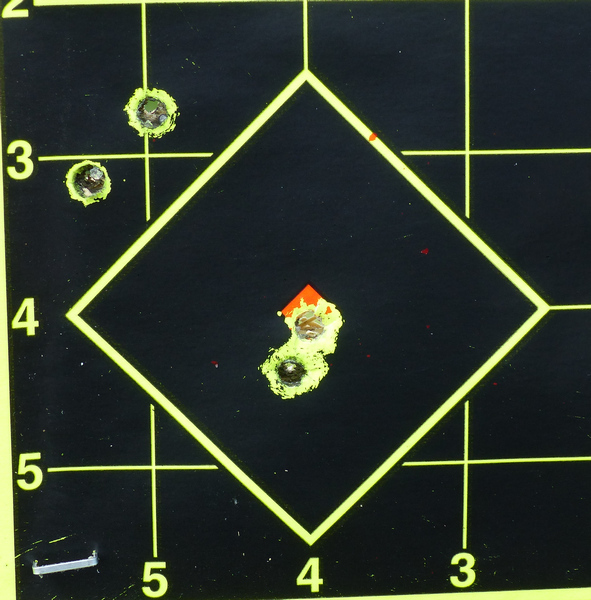 After topping off the Ruger American Predator .223 Remington with a confirmed, flawless Sightron Big Sky SII 3-9 x 42mm scope, four different types of premium factory ammunition were tried at 100 yards. Regardless of whether it was Hornady Superformance loads, Barnes factory ammo, or Lapua rounds, the rifle did essentially the same thing. That is, it shot to two distinctly different points of impact. Above is an example of what I'm referring to, with Lapua Aficionado+ 69 grain loads. It did this on two separate range sessions as well. Call it the luck of the draw or whatever, but based on this test rifle the accuracy is disappointing. I did contact Ruger, they thanked me for the honesty, and said that are going to go through this rifle. In times past, it has been my experience that around 95% of good quality product falls into a very close range. Then, you have roughly 2-1/2% that is spectacularly good, shoots everything you feed it accurately, and for some esoteric reason is just crazy good. Then, you have the other 2-1/2%, for various and sundry reasons, just isn't up to snuff. It looks like this is one of those not up to snuff moments. There isn't much else to say at this juncture except that it isn't characteristic of recent Ruger product, for the Mini-14 recently tested was MOA accurate and the Ruger American Rimfire .22 WinMag recently tested (http://randywakeman.com/RugerReinventstheRimfireRifleRugerAmericanREVIEW.htm) shoots better than 1/2 MOA. This review will be updated when more information becomes available. 8/30/2014 UPDATE: The test rifle was returned to Ruger. Ruger determined that the example rifle was indeed a miserable screwed-up mess, shooting some 17 inches high. According to Ruger, it wasn't worth attempting to repair, so it was quickly cut-up and thrown away. A replacement rifle is being sent out, so we will have the "Ruger American Predator Round Two"review in the future for you. 10/24/2014 UPDATE: The replacement rifle did not have an excessively stiff safety, but there was obvious interference between the bolt and the receiver, not an acceptably smooth action whatsoever. It is obvious poor machining on the receiver, not present on the first rifle that was tested. The accuracy of the replacement Ruger American Predator was frustratingly poor, essentially a 2-1/2 - 3-1/2 inch gun at 100 yards, with premium ammunition, as shown above. It isn't possible for me to recommend such a horribly poor-performing rifle. Ironically, the "Predator" model is promised to be a more accurate, heavier barrel profile version of the standard Ruger American. It appears to be a specific rifle model and chambering to avoid, based on its multiple problems and its refusal to group in the case of two different new-in-the-box rifles. With a very rough action with obvious bolt receiver interference, and completely unacceptable accuracy, there is little else to say except, "Not recommended." Ruger was immediately advised of these issues and this second poorly-performing rifle has been returned to Ruger for their inspection. If Ruger has some findings or other commentary, it will be reported here in yet another update. As is, it remains the worst shooting .223 bolt-action I've tested in years, twice in a row. 11/07/2014 UPDATE: According to Ruger, " . . .checked the bolt and do agree that something is not right with the lock-up of the bolt. In discussing with the engineers, they agreed that this rifle needs to be looked at and are in mid-autopsy today." 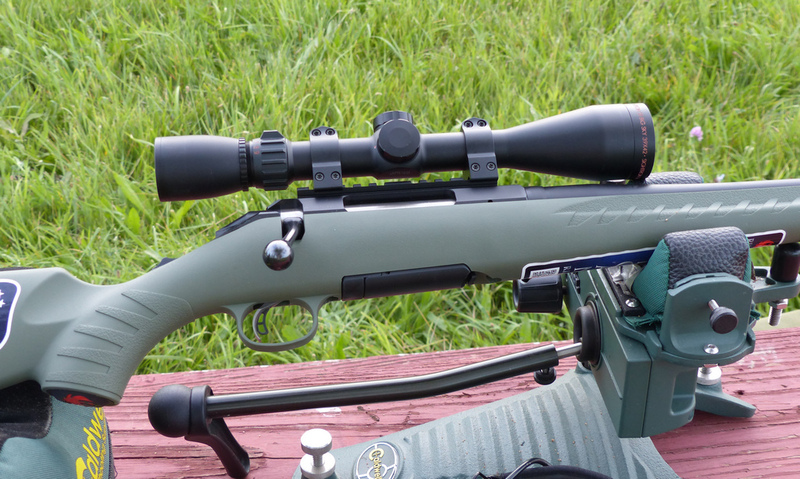 Although things can change in concert with chambering, after two consecutive brand-new rifles with multiple problems, Randy Wakeman Outdoors is simply calling it a day with the Ruger American Predator, actually six days of range time, and moving on. While I realize the Ruger American is price-point product available at less cost than the 1/2 MOA CZ-527 American and Savage Model 25 Classic Sporter .223 examples I've previously tested, it is not less expensive than the Savage "Edge" renamed the Axis, tested here in .223 http://randywakeman.com/SavageEdge223.htm and here in .308 http://randywakeman.com/Savage_EDGE_308_Winchester.htm . While the majority of Ruger product tested in the last few years has been very good to excellent, it isn't possible to recommend such a poorly made, poor-performing product such as this. Both of the tested Ruger American Predator rifles have obvious manufacturing flaws, flaws that the manufacturer has seen and agreed with. The written feedback from Ruger that states "something is not right with the lock-up of the bolt" is hardly resolving anything. The poor workmanship, poor quality control, and unacceptable accuracy on two consecutive rifles with no resolution is more than enough to suggest staying away from this product. I expect far better from 2014 model year bolt-action rifles and so do my readers. ©1999 - 2014 Randy Wakeman. All Rights Reserved.